My Choice! is a project that aims to raise awareness among the youth about Sustainability. We offer a holistic understanding of sustainability taught through a simple model known as Society, Economy and Environment. The Environment is impacted by our human footprint; this footprint is the result of diverse community interactions (economy, leisure, family) in any given society. Social activism, or civil society, is shaped by embedding values in the people that are part of the society and who will take up responsibility for that society. It is therefore vital for youth to grab this inclusive picture of sustainability to ensure a positive future generation of prosperity and increased quality of life. 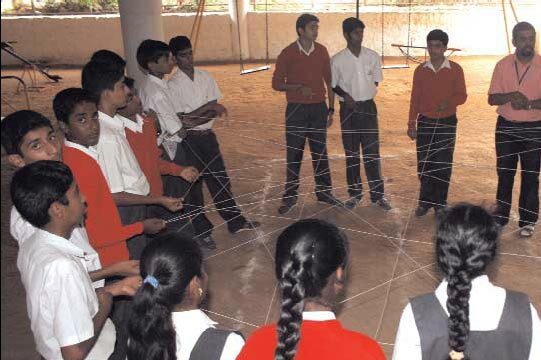 The picture shows a circle of people connected by a web. This activity looks at interdependence of global issues. This toolkit aims to provide an overview for the programme and how it can be run in not only colleges and institutes, but also in companies of any size. All that is required is a committed team to organize some logistics, and a series of individuals with a passion for sustainability. This number can vary depending on how many schools or students you want to reach out to. The point to remember here is to recruit individuals, who are fun, can relate well with kids, and have an interest in learning about Sustainability. The big bonus here is that through being a mentor, the individual actually learns more about him/herself and their personal actions in sustainability by going through this process. It is important to establish rules of conduct, and training on material before hand so that the next stage can run smoothly. Stage 2: They share an understanding of sustainability through a workshop in the school. so that we don’t suffer the negative consequences in the future. Understanding the Venn diagram of People, Business and Nature (Society, Economy, Environment). Grasp the idea that all actions and events in the world are interrelated and interdependent – there are no such things as isolated actions and response. Stage 3: The most interested students get a deeper understanding through a simulation game. Are we having fun yet? If not, then we surely will now! Stage 3 represents a simulation game with a duration of 3 – 4 hours. Here the mentors will plan and facilitate a series of activity-based learning games that will help develop soft skills while teaching them core ideas of sustainability. Understanding the big picture of sustainability (that is, global warming, pollution, security, overpopulation – nature, business and society). Introduce the concept of ‘Tragedy of the Commons’. Guide them through a product life cycle of their favourite things, move from linear product life cycle to closed loop product life cycle. What is a network or system, how can we simplify it if it no longer makes sense and is overly ineffective? Understanding interdependence from the perspective of various decision makers (Government, NGOs, Companies, and Individuals). What is their vision for a sustainable future in 20 years time? Stage 4: Through mentorship students will execute a project in their school. you with their creativity and ability to grasp the concept of sustainability. The goal of the project is simple: Make one change in your school that can help it become closer to being zero-waste. Make sure you start the projects with an audit of the school, so the kids can identify unsustainable practices, then come up with ideas, and measure the ideas based on the Venn diagram model. Does it make Business, People and Nature sense? If not, how can we improve it? Stage 5: The projects are showcased and rewarded, raising awareness in the community about sustainability. The last stage of this programme is the most glamorous, as you want to invite the public, partners, other schools and dignitaries to the event. This event can be imagined in many ways, but it should aim to capture the excitement of the kids in presenting their projects ideas, and rewarding them thoroughly for all their hard work. The benefit of inviting so much public is that they too get to play a hand in learning about sustainability. Prizes should further the kids development in understanding about sustainability, such as nature retreats or educational books. Stage 6: Taking our learning virtually! Yes that is right, we have a special sixth stage not represented in the diagram, but ever more important. It is taking the learning of this programme and giving the students and mentors an online platform to connect with other youth across the globe, who are passionate about sustainability. By accessing the My Choice social network, participants gain access to networks of young people, fresh media and resources to help them learn more about sustainability, and best of all: contribute to the discussion. You’re done! You’ve made a great contribution to society, you’ve learnt a lot along the way, and you’ve networked with others building the same vision and promoted your brand every step of the way. What could be more satisfying? After all, it’s your choice for a sustainable future! Kurt Archer, currently living in Calgary, Canada, has spent 2 years working on inter-cultural dialogue and leadership development with young people in Pakistan. Kurt has travelled extensively throughout Asia documenting grassroots environmental projects, and is a founding member of Pakistan Sustainability Network and has launched a youth sustainability program called my world, my choice!